John Legend and Chrissy Teigen welcomed their first child, little Luna, into the world in April, but are they planning to give us more precious babies in the near future? Pregnancy rumors have been swirling around the model over the last few weeks, but while we've already confirmed they're not expecting just yet, Legend assured us they eventually hope to be. "We want to have more," he told E! 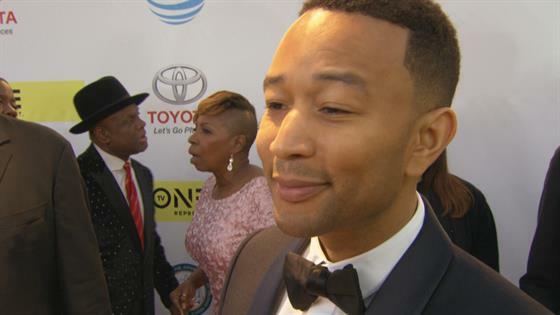 News at the 48th Annual NAACP Image Awards this weekend, opening up about the IVF process. "We had a hard time doing it ourselves, so we got some help. It resulted in Luna and hopefully it will result in a couple more kids in the future." And speaking of his adorable baby girl, Legend couldn't help but gush, "She's doing so well. She's so fun right now. She's moving around a lot. She's not walking yet, but she's crawling with speed and exuberance." But before the musician and his wife can get to thinking about more kids, they're working on getting through awards season—which they've totally owned over the last couple months. With the Golden Globes and the Grammys behind them, their next big show is the Oscars coming up at the end of the month where Legend will perform some of the incredible music from La La Land. "I'm excited, I love the songs," he beamed. "Emma [Stone] and Ryan [Gosling] asked me to perform the songs they sang in the movie, and I was happy to do it. We're happy to celebrate the film itself and all the great music that went around it." Well, we certainly can't wait either!